The photo below is the beads bracelet that I made and I want to share it with you. My last week post is about the profit of beads bracelet. Because I like the beads, I made it sideline income. I am also happy with the results because it’s easy to sell especially to the teenagers. 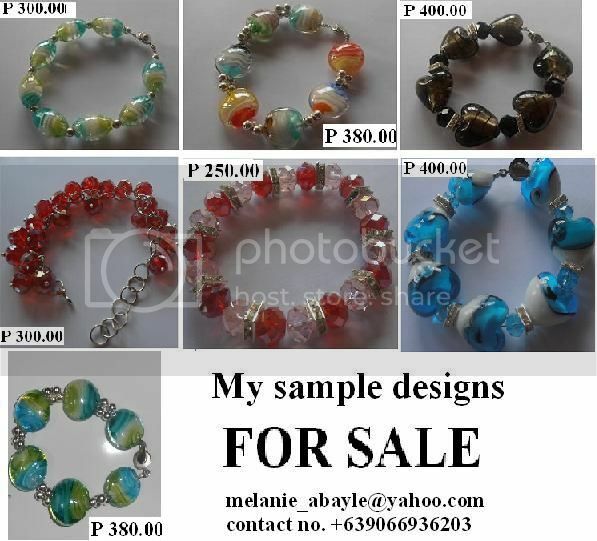 I was made a variety of design even I sleep deeply at night to make beads bracelet. Because I just really enjoy making a different design of beads bracelet, I do not realize the time. At the first time to make a bracelet, I feel a little hard to form a different design. But now it’s easy to be learned because of the everyday makes different design and have many ideas to formed. Anyway, the photo below is the example of my finish product. I tried to upload in my facebook account and tag to all my friends. I was really happy because they liked my work. Some of them were ordered and others I will sell at home. And I would also like to thank my sister because she helps me to sell in their company.